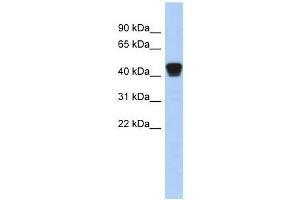 TXNDC4 antibody used at 1 ug/ml to detect target protein. Background TXNDC4 mediates thiol-dependent retention in the early secretory pathway, forming mixed disulfides with substrate proteins through its conserved CRFS motif. TXNDC4 inhibits the calcium channel activity of ITPR1. TXNDC4 may have a role in the control of oxidative protein folding in the endoplasmic reticulum. TXNDC4 is required to retain ERO1L and ERO1LB in the endoplasmic reticulum.